COPROGET S.r.l. 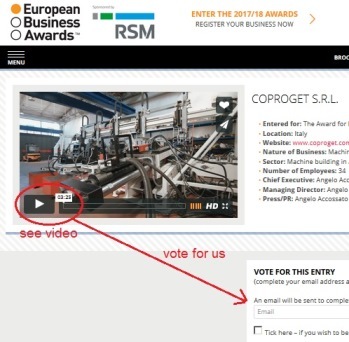 has been named a National Champion for Italy in The European Business Awards 2016/2017, Europe's largest business competition set up to celebrate business excellence and best practice in the European business community. The Awards, now in its 10th year, is supported by business leaders, academics and political representatives from across Europe, and this year engaged with over 33.000 businesses from 34 countries. 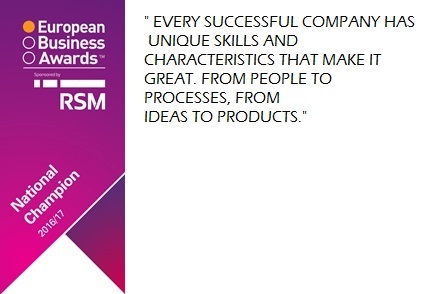 The European Business Awards exist to recognize and reward excellence, best practice and innovation in companies across Europe. It is the showcase of Europe's skills, achievements and innovation in the field of business. The European Business Awards recognise business excellence from all industry sectors, embracing businesses of all sizes and ages and from all European countries. The guiding principles of the Awards are Innovation, Ethics and Success. SUCCESS – The demonstration of commercial success in the relevant market or sector. INNOVATION – The pursuit of performance improvement and development, from products through to processes. ETHICS – Demonstration of conduct that respects legislation, the environment and the rights of all workers and stakeholders. We worked according to our motto "The last piece for your perfection" very hard for our esteemed customers and want to thank them for their confidence. But especially we want to thank our staff making this true.